One and a half year after releasing her second album, Amira does what many have been hoping for: she went back into the studio to record her third album, which will be released later this year! After Amira enchanted the audience as well as the other artists and production team of the Classics Is Groot and Afrikaans Is Groot concerts in 2016, she has now signed up with Coleske Artists, one of South Africa’s leading record companies, to record and produce her new album. 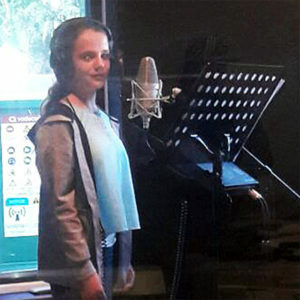 Preparations have started in May, when Amira first visited the studio in Pretoria to start working on her new songs. Part of the songs has been written especially for Amira by Johan Oberholzer, one of South Africa’s leading composers. During the recordings, Corlea Botha will coach and assist Amira. They work very well together and, while at it, they have even prepared a duet to be performed during this year’s Classics Is Groot concert. In June and July, recording will be continued. At this time it is not clear yet when Amira’s new album will be released. Next → Next post: Christmas concerts planned!